Moses On The Mesa/FUND US! 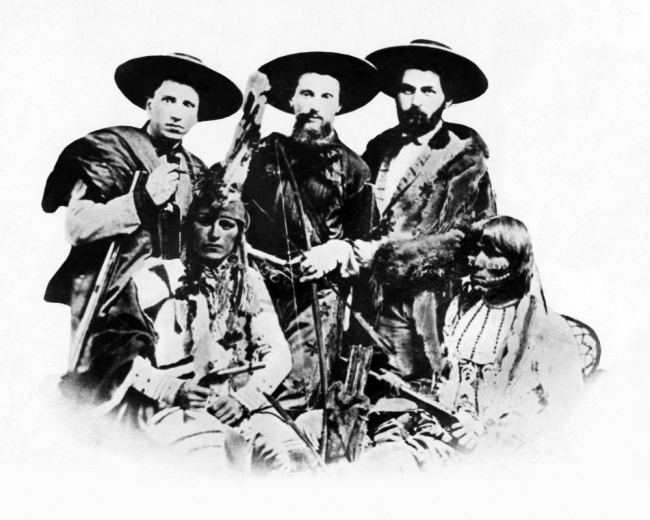 pictured above: New Mexico Jewish pioneer merchants Bernard Seligman, Zadoc Staab, Lehman Spiegelberg and Kiowa Indian scouts. We are very enthusiastic and hard-working filmmakers. We hope that our films will shed light on lesser-known, but important historical stories and help understand how people of seemingly diverse cultures can live together. But we cannot do it alone. We could use some help in making the short film and the documentary series. We are very adept at independent filmmaking, where you learn to do a lot with a little. Still, making films is costly and historical filmmaking even more so. It requires very specific costumes, locations, animals and production design. If you can help us financially, please make donations either through Paypal, or we can also process tax-deductible contributions via our umbrella 501c3 organization. If you’d like to contribute directly, please click on the Paypal button below. Paypal accepts all kinds of credit and debit cards. If you’d like to make a tax-deductible donation, please email us and we can do the appropriate paperwork. We are also looking for help in other ways. If you have connections for discounted equipment or sheep rental, or can help with in-kind services like doing our VFX, or can let us borrow your 19th-century steamboat or would like to be interviewed for our documentary – please reach out and great thanks to you!